In this episode we bring you an interview with Emma Clifford, founder and director of Animal Balance, a unique organization headquartered in Bend, that implements high-volume spay and neuter campaigns for dogs and cats around the world. In 2002, Emma found out that the cats and dogs of the Galapagos Islands were being poisoned—as a result, she founded Animal Balance to address the problem directly and humanely. Since then, Animal Balance has expanded to help in other nations such as The Dominican Republic and The Bahamas, changing the lives of both people and animals in the process. Judy and Barb also discuss a very important subject that we’ve never before addressed on the show… vegan hotdogs! 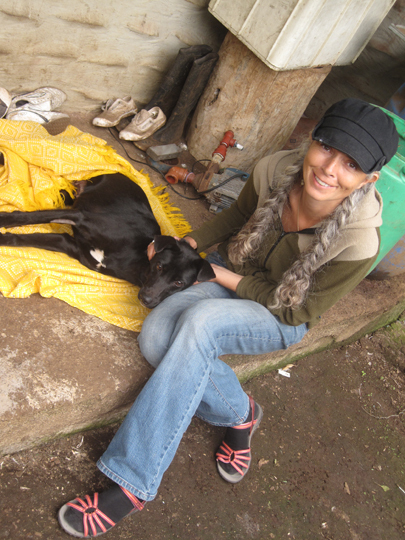 Emma Clifford is the founder and director of Animal Balance, a unique organization headquarted in Bend, that travels to island nations around the world, implementing high volume, community based sterilization campaigns for dogs and cats. As a teenager, Emma became vegan, and worked to stop fox hunting and other cruel practices in the UK. Later, she managed and expanded the San Francisco SPCA Feral Cat program. In 2002, Emma found out that the cats and dogs of the Galapagos Islands were being poisoned—as a result, she founded Animal Balance in 2003 to address the problem directly and humanely. Since then, Animal Balance has expanded to help islands globally. Emma speaks at conferences around the world helping other countries to start high volume MASH clinics and gives advice on humane animal management strategies. Emma talks about all of that with us, and also give us an update on some current and upcoming campaigns. VegNet Bend monthly meeting and potluck: 6p, July 25, The Environmental Center, 16 NW Kansas, Bend. This month is the 3rd annual Luau. VegNet will provide gourmet Field Roast grain hotdogs, veggie burgers, buns, and condiments. Bring a vegan side dish to share and join in the fun. If you’re a drummer or play a musical instrument and would like to share your talent at the event, contact info@vegnetbend.org.